Bandhan Monthly Savings Scheme is a step towards systematic planning of Jewellery purchases on yearly basis. 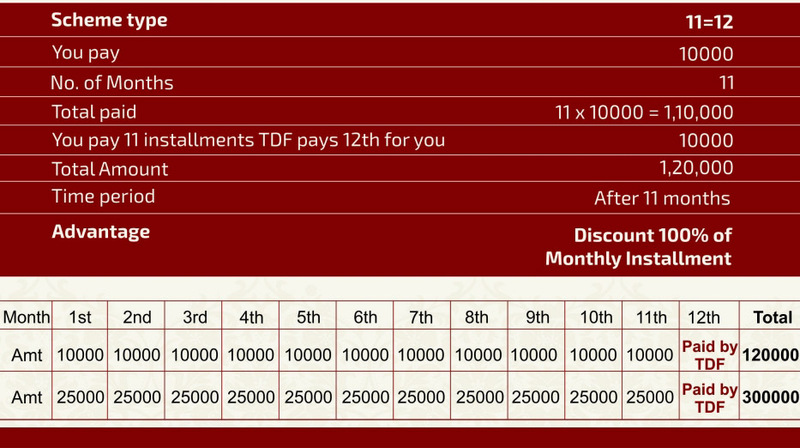 The scheme gives an opportunity to get jewellery of your choice where you pay monthly installments and additional benefits will be paid by TDF. The installment amount to be paid on a monthly basis is Rs. 10,000 or more. Monthly installments should paid before 15th of every month, till the date of maturity of the scheme, failing which the member will be unable to avail the benefit of the scheme. Privileged scheme members will be intimated in advance about the new arrivals, offers, events via SMS,Phone calls and E-mails. One time *No Making Charges* coupon will be allotted for one ready product only. This coupon can not be clubbed with Scheme Redemption. This coupon is valid only for the purchase of Diamond Jewellery. If the scheme is discontinued in between,80% of the monthly installments paid till date will be refunded. If any month is skipped, a penalty of Rs. 200 will be charged per delayed month. If you like our products and services, kindly appreciate us by joining our schemes.